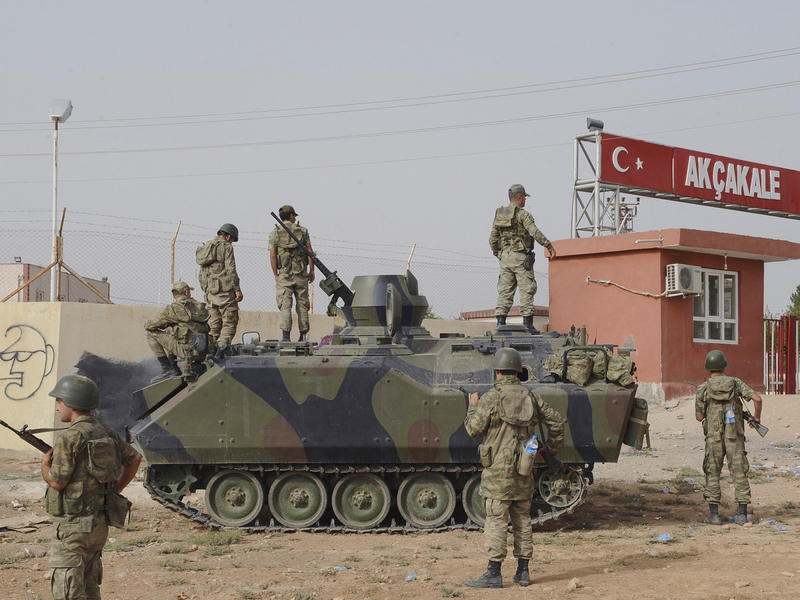 AKCAKALE, Turkey Turkey and Syria fired artillery and mortars across their volatile border for a fifth consecutive day on Sunday, in one of the most serious and prolonged flare-ups of violence along the frontier. The exchange of fire stoked fears that Syria's civil war will escalate into a regional conflagration drawing in NATO member Turkey, once an ally of President Bashar Assad but now a key supporter of the rebels fighting to topple him. Turkish Foreign Minister Ahmet Davutoglu had warned on Saturday that Ankara would respond forcefully to each errant Syrian shell that lands on Turkish soil. Ankara's warning was coupled by an apparent diplomatic push by the Turkish leadership to promote Syrian Vice President Farouk al-Sharaa as a possible figure to head a transitional administration to end the conflict in the country. In an interview with Turkish state television TRT Saturday, Davutoglu said that al-Sharaa was a figure "whose hands are not contaminated in blood" and therefore acceptable to Syrian opposition groups. It was not clear whether the Turkish stance was coordinated with other allies, but the candid remarks by Davutoglu suggested some consensus might be emerging over a future role for him. Al-Sharaa, 73, a close associate and longtime loyalist to the Assad family, has been a controversial figure since the start of the uprising. He appeared in public in late August for the first time in weeks, ending repeated rumors that he had defected. The regime has suffered a string of prominent defections in recent months, though Assad's inner circle and military have largely kept their cohesive stance behind him. Early on in the uprising, the Syrian president delegated to al-Sharaa, a skilled diplomat, responsibility for holding a dialogue with the opposition. A Sunni from the southern town of Daraa, birthplace of the Syrian uprising, al-Sharaa's silence since the start of the uprising made him a prime candidate for rumors that he broke with the regime. "No one knows the system better than Farouk al-Sharaa," said Davutoglu, adding that al-Sharaa has not been involved in the violence and massacres in Syria. The Syrian opposition is deeply fragmented, and various factions would likely disagree on whether they would accept him to lead a transitional government. Meanwhile, there was little sign that the exchange of fire near the border, although still at a fairly low level, was ebbing. It began five days ago when a Syrian shell killed five civilians in a Turkish border town. Turkey's parliament subsequently approved a bill that would allow cross border military operations there. Damascus offered a rare apology, but shells and mortar rounds continue to fly into Turkish territory. On Sunday, an Associated Press journalist witnessed a round landing some 200 yards inside Turkey, near the border town of Akcakale. A short time later, eight artillery shells could be heard fired from Turkey. In the Turkish town of Akcakale, mayor Abdulhakim Ayhan said shrapnel from the Syrian mortar round caused some damage to a grain depot, but no one was hurt. He confirmed that Turkish artillery immediately returned fire. The Anadolu Agency reported that Assad's forces have been shelling the town of Tal Abyad, just across from Akcakale, which is controlled by Syrian rebels. Turkey's private Dogan news agency reported that a six-vehicle military convoy, including two carrying howitzers, was seen traveling from the city of Gaziantep toward the Syrian border. Inside Syria, forces loyal to Assad clashed with rebels across the country, from the northern city of Aleppo to the southern border with Jordan, killing according to activist groups at least 90 people across the country. Activists said opposition fighters were strengthening their hold over the village off Khirbet al-Jouz, in the northern province of Idlib, which borders Turkey and where violent clashes broke out a day earlier. The Turkish state-run Anadolu news agency said Sunday that the rebels had regained full control of Khirbet al-Jouz. It said the Syrian army was forced to "pull back" following an "offensive" by some 700 rebels. It also reported that Assad's troops were forced to retreat some 12 miles toward the town of Jisr al-Shughour. It said rebels in Khirbet al-Jouz celebrated their victory by firing their weapons into the air. The Britain-based Syrian Observatory for Human Rights said regime forces pulled out of two villages in the Idlib countryside near Turkey. In Khirbet al-Jouz, wounded Syrian soldiers were left to fend for themselves after government troops were forced to retreat from the area, the Observatory said. The reports could not be independently confirmed, and it was not clear whether the wounded soldiers were captured by the rebels. In Damascus, a car bomb exploded in the parking lot of the local police headquarters in central Damascus, killing one member of the military, the state-run SANA news agency said. The explosion is the latest in a series of bombs and suicide attack targeting security personnel and government institutions. Elsewhere, Syrian troops were widening their offensive to retake rebel-held areas in the northern city of Aleppo and the suburbs of Damascus, as well as the central province of Homs and villages on the southern border with Jordan. The Observatory said some of the heaviest fighting Sunday was in Aleppo province. At least three people were killed and scores were wounded when the army pounded the town of Manbaj in Aleppo's suburbs. Syria's defense minister said Saturday that the government is ready to give amnesty to rebels who repent and those who don't "will be crushed under the feet of our soldiers." Gen. Fahd Jassem al-Freij, who became defense minister in July after his predecessor was assassinated, also claimed that the regime was getting the upper hand. "The most dangerous parts of the conspiracy have been passed and the killing is on its way to decline," he said. Damascus denies it is facing a popular uprising, instead blaming the violence on a foreign conspiracy to punish it for its support for anti-Israeli groups such as Lebanon's Hezbollah. Despite the government's claims of being on the brink of restoring stability, the violence across the country shows no signs of abating. Activists say that more than 30,000 people have been killed since the anti-Assad uprising began.